Germs. They're so gross, and guess what? They're everywhere! Unless you're constantly washing your hands, or sanitizing them (I'm a big fan of hand sanitizer), you're likely picking up germs everywhere you go, and bringing them home. When I think about the germiest places of my home, the kitchen and bathroom immediately come to mind. I try to keep the kitchen as clean as possible, but when you're working pretty much full time, have little ones at home, and are cooking three meals a day, eventually, things are bound to get a little out of hand. Another place where I know germs are lurking- the bathroom. I hate cleaning the bathroom, mainly because I am the only female in my house, and boys are gross. 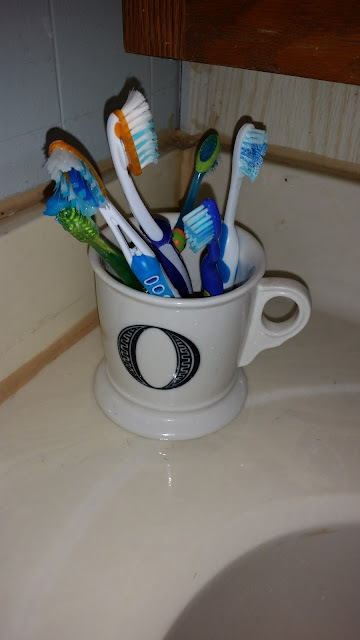 I didn't realize until recently that possibly the grossest place in our bathroom was our toothbrush holder. Yuck! 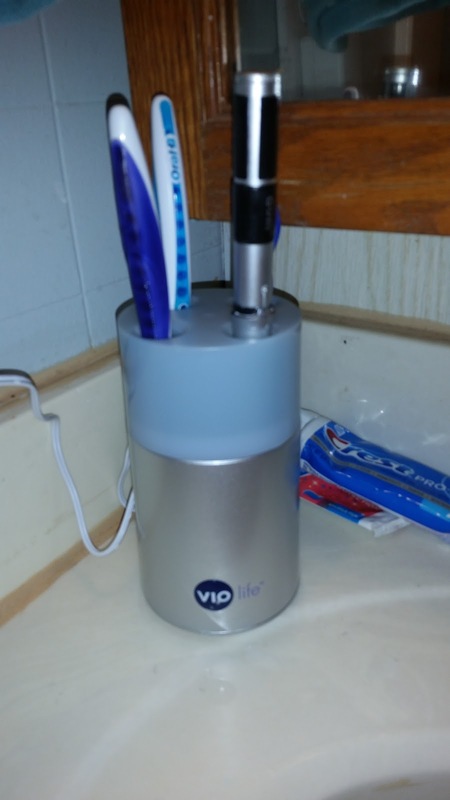 We needed a solution that would keep our brushes clean, and keep germs at bay, so we turned to Violife! 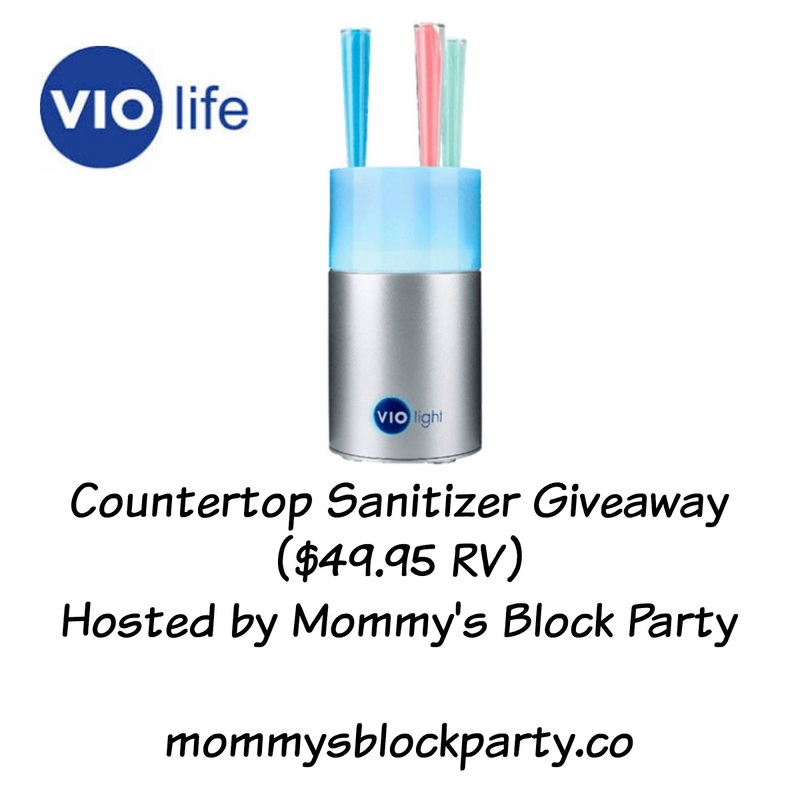 Violife, formerly Violight, started back in 2004, with their original Countertop Sanitizer. Over the years, Violife has added even more UV products to their lineup. In just a few years, they created the world's first UV Cell Phone Sanitizer, and soon after they created their newest runaway hit, the Slim Sonic portable electric toothbrush. Slim continues the tradition of marrying great style...even a hint of fashion...to an otherwise mundane item: the toothbrush. People who buy Violife care about their health, their home, their family, and their personal sense of style. Why Violife? Now you know! BETTER HEALTH: Violife toothbrush sanitizers eliminate 99.9% of the germs that simple rinsing leaves behind. 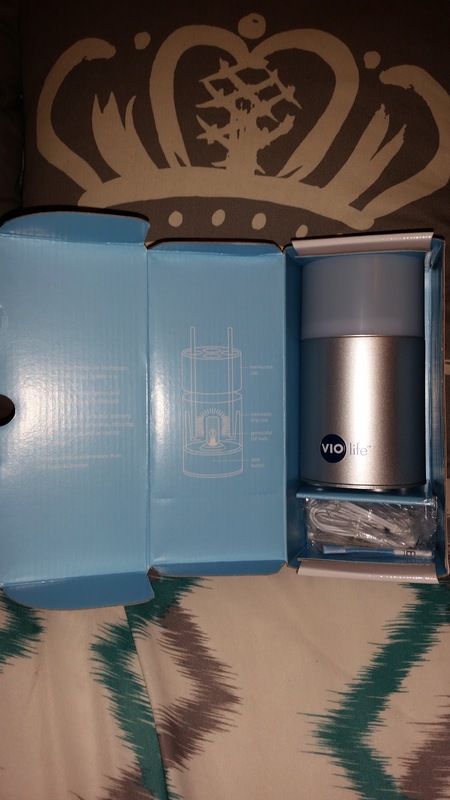 We were excited to experience a new sense of true cleaning and sanitizing at home. 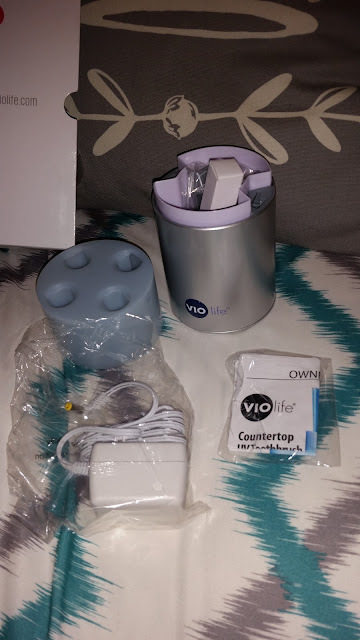 We were sent the Violife Countertop Sanitizer (yes, the Violife product that started it all! ), and I couldn't wait to set it up in our bathroom! 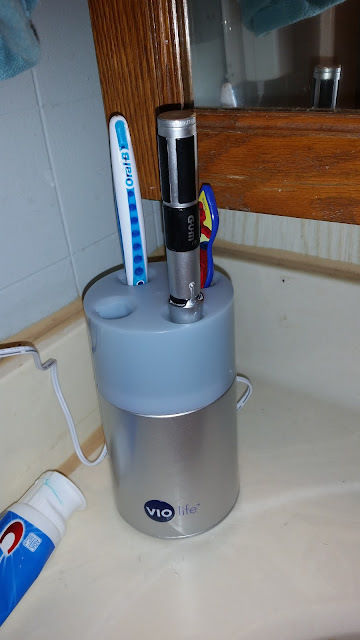 I was definitely ready to say goodbye to the nasty toothbrush holder we had been using, and say hello to clean, sanitized toothbrushes. Our Countertop Sanitizer arrived in its own little box, perfecly packaged. 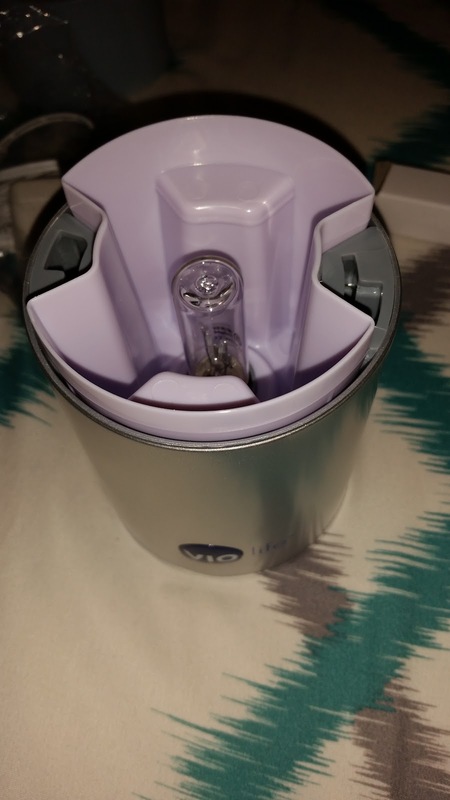 The sanitizer came with all of the pieces shown here- the sanitizer, drip cup, lid, bulb, power adapter, pegs, and owner's manual. I'm not usually one for reading through the instructions before just jumping the gun and putting a product together the way I think it ought to work... but I thought it would be best to give the guide a read through! The instructions were very clear, and easy to follow. I followed them step by step, and had no trouble at all. This is the UV bulb for the sanitizer. I picked it up just to give a good sense of the size. The bulb is pretty sturdy, but I would still urge you to be careful with it, as you would with any other bulb. 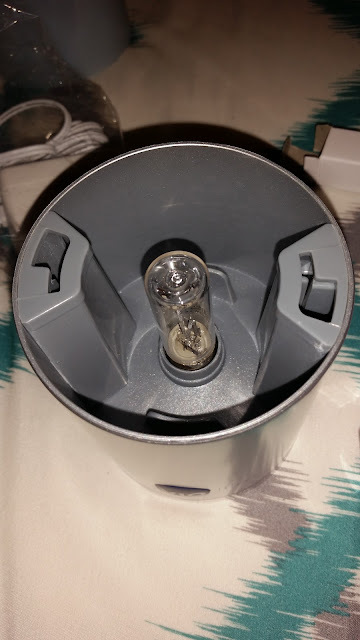 I picked up a tissue, as per the instructions, and gently screwed the bulb into the base of the sanitizer. 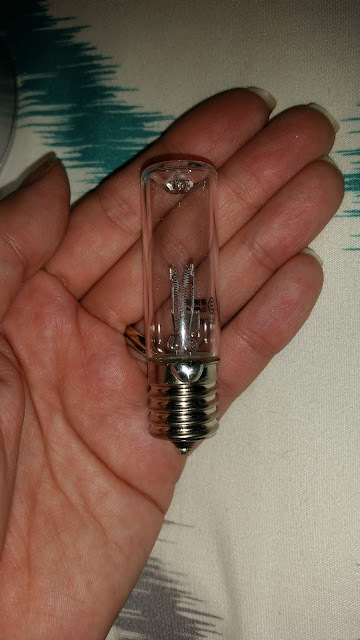 The trick to the bulb is to stop turning it once it starts giving you resistance. Do not over tighten this bulb. After the bulb is in place, the rest of the sanitizer can be put together. 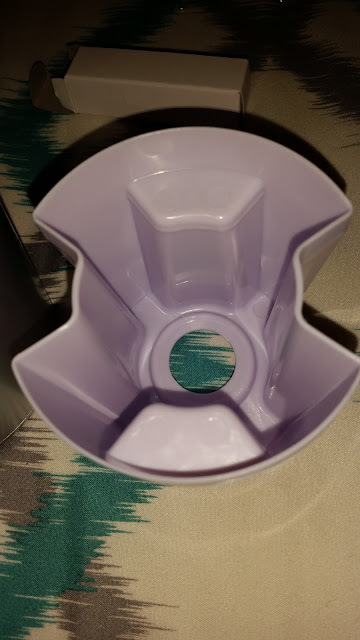 This is the drip tray, with will catch any water that may drip off of the wet toothbrushes. The drip tray fits right onto the sanitizer. The tray should be checked, and rinsed/cleaned about once a week. After the other parts are in place, you can fit the topper onto the sanitizer. Turn it counter clockwise, until you hear it click into place. I was impressed by how quick and easy the set up/assembly process was for the countertop sanitizer. I felt pretty accomplished, and proud that I didn't need help from my husband. The only left to do, was to plug in the power adapter, and set this bad boy up in the bathroom. 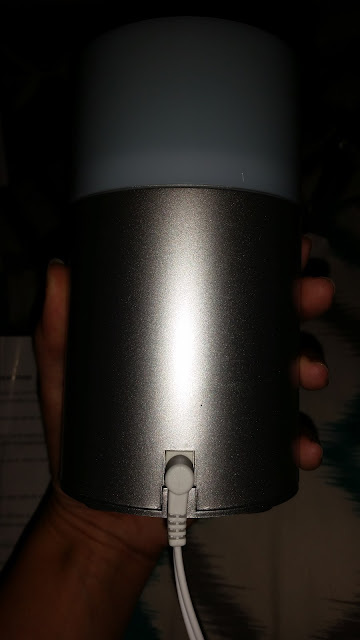 The tiny spot for the power cord is located in the back of the sanitizer. Now, just a general warning- what you're about to see may disturb you. Just remember, this is a no-judgement zone, moms! So this is how we were storing our toothbrushes before. In a cup, on the counter. Yes, my son has four toothbrushes, which he likes to switch on and off, depending on which one he feels like using. I am usually the last one to brush teeth in the morning. I wait until everyone else is done, so I can have a quiet moment to brush in peace. Once the boys were out of the house, and my teeth were brushed, I ditched the cup we were using (yuck, by the way! ), and plugged the new Violife Countertop Sanitizer into the wall. A vast imporvement- already, this space looks cleaner. The countertop sanitizer takes up very little space, and keeps each toothbrush from touching the others. I love the the brushes face downward, which protects the bristles that wind up in our mouths from germs, hairspray, etc. Each toothbrush has its own slot. 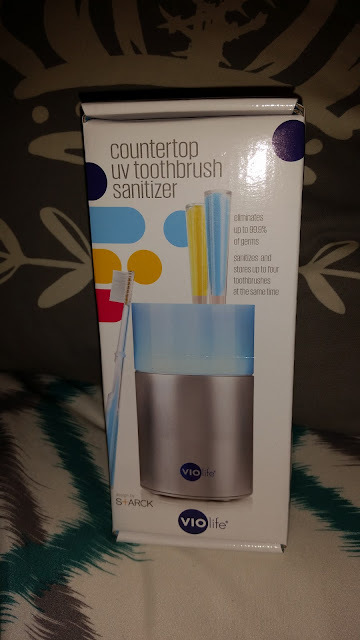 If we had electronic toothbrushes, we would have also used the pegs that came with this sanitizer, but we don't have those, so they weren't needed. We'll hold onto them, in case that changes. The Countertop Sanitizer in action... all lit up, and sanitizing away! To use the sanitizer, just place the brushes into the holder, and make sure it's plugged in. Next, simply press the VIO button, and then the sanitizer will light up, and the sanitizing process will last for about ten minutes. Afterward, the light will turn off automatically, and your toothbrushes will be 99.9% germ free, and clean- ready for their next use. You didn't start this germ fight, but you'll finish it. 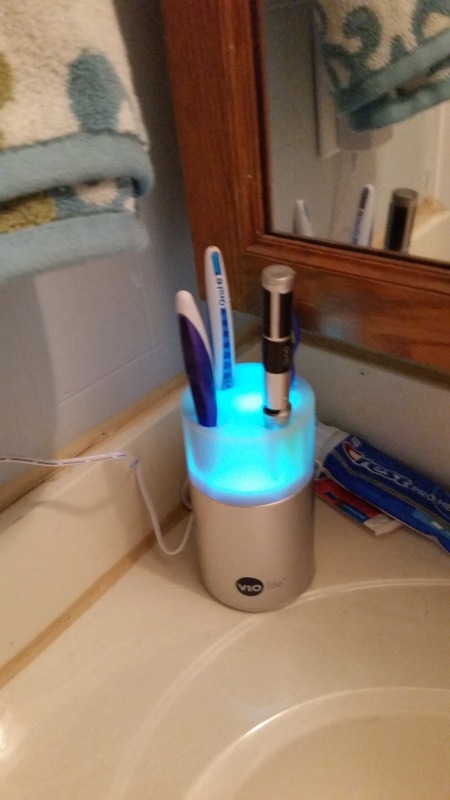 Our Original Countertop UV Sanitizer kills 99.9% of all germs with a special germicidal UV bulb, leaving your toothbrush fresh and clean for the next use. Just press the button - it shuts off automatically when it's done. Got a full house? No problem! Our Original Countertop UV Sanitizer is designed to sanitize electric, manual and kids' toothbrushes - up to 4 at once. We have a hard enough time fighting off germs once the back to school season starts. This is just one way we're taking a stand against germs in our house- we're putting our feet down, and saying NO WAY! I will be excited to see how this product works and holds up over time, but for now, all I can say is that we love it. This would make a great gift for a wedding shower or housewarming, especially if you're like me, and you like to give gifts that might not be on someone's registry. 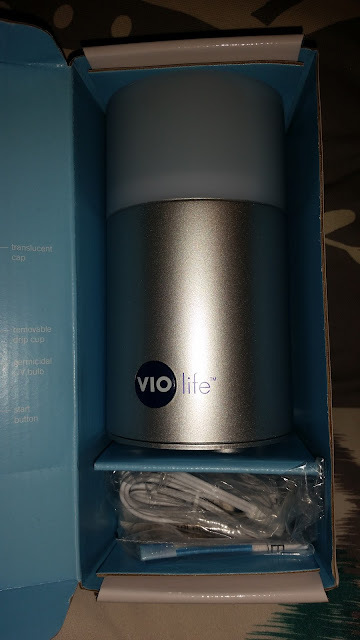 If you're looking for a great toothbrush sanitizer, sonic toothbrush, or other great travel sanitizing products, be sure to check out Violife! Make sure to keep Violife on your radar this holiday season! 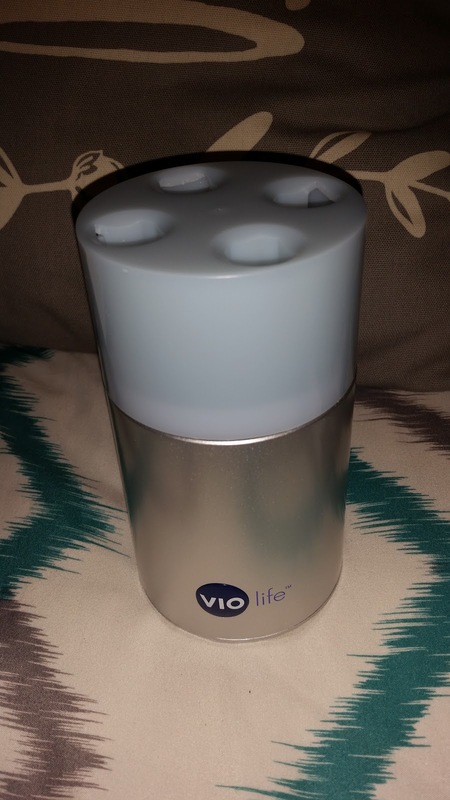 Head on over to Violife to browse all of their current sanitizing products, and more! You can also connect with Violife through Facebook, Twitter, Pinterest, and Instagram. You can also check out the Violife blog. 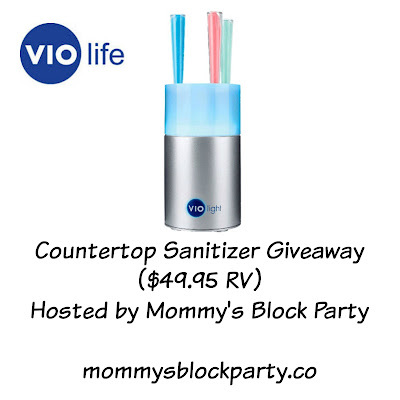 One lucky reader will win their own Violife Countertop Sanitizer, valued at $49.95. This giveaway is open to US residents, 18 and older. One entry per household, no PO Boxes, please. Just use the RC entry form below to enter for your chance to win this awesome prize! MBP is not responsible for prize fulfillment. Please see our policies page for complete details. Special thanks to Violife for allowing us to try this wonderful product and for offering this fantastic giveaway for our readers! This would help sanitizing our toothbrushes more easier. I'm trying to keep myself healthier And sanitizing will help! We'd love to have more sanitary toothbrushes! I use to keep our toothbrushes in a cup until one morning I discovered my cat sitting on the sink chewing my toothbrush and rubbing his face on it. I keep the new ones in the medicine cabinet now. This would be useful in sanitizing those kitty cat germs . I've been worried about toothbrush germs ever since I read an article about it. This would put my mind at ease. Because we use alot of sprays in our bathroom and I worry about them getting on our toothbrushes all the time and that my kids don't get theirs clean very well. This appeals to be because out bathroom is SO tiny, the cup where the toothbrushes sit on the sink is RIGHT next to the toilet. Ugh! I like that it will santize my toothbrushes with no worries.